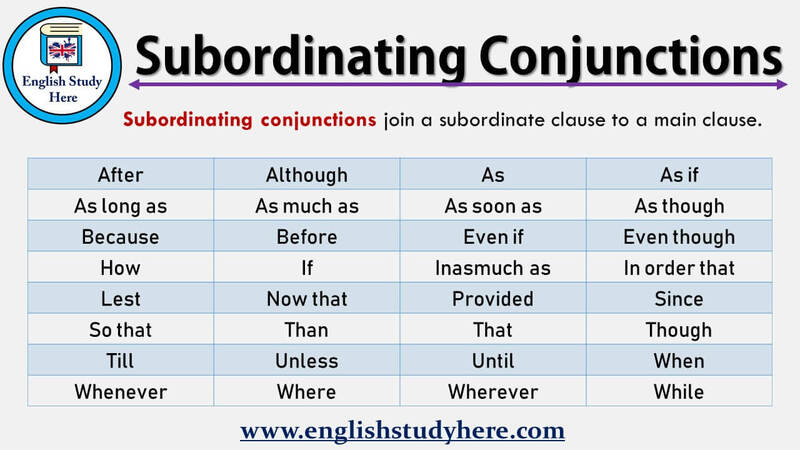 Subordinating conjunctions join a subordinate clause to a main clause. After you finish your homework, you should go to bed. Although studying French seems difficult, actually it’s simpler than you think. As soon as she gets up , she brush her teeth. You look as though you know each other. As you get older, moving supermarket gets harder. He looks as if he is rich. You can spend money as long as you earn enough money. She was late because she missed the taxi. Before you play football, you should finish your homework. Even if George earned a big salary, he would not buy a fast car. Even although Michael helps to the poor, actually she isn’t rich. If it rains, the match will be canceled. You study very much so that you could succeed. While my cat was running it fell down. When I got off the bus, I fell down. Here is most important conjunctions list and example sentences.